A futuristic neon-filled parkour adventure is waiting for you when Hover releases on the Nintendo Switch on September 20, 2018! Check out the trailer and official press release below! Independent developer Midgar Studio and video game publisher Playdius announced today that parkour game Hover will make its debut on consoles starting on Sept. 18, 2018 for $24,99/24,99€. 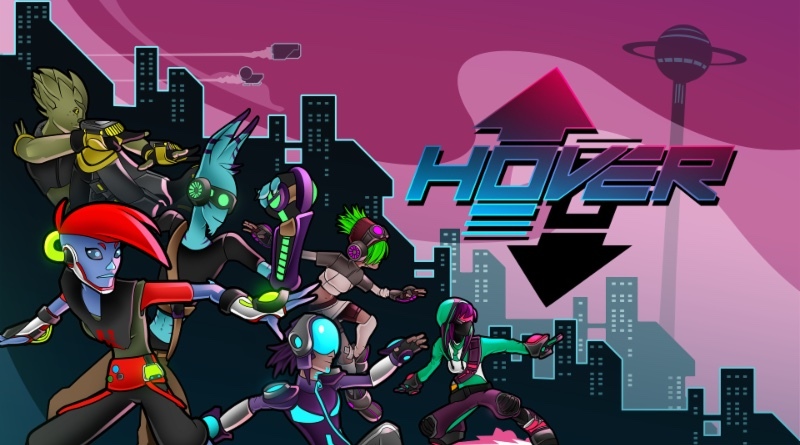 Previously released on Steam in May, 2017 after a successful Kickstarter campaign, Hover will be available on PlayStation®4 (Sept. 18), and Xbox One (Sept. 19), and Nintendo Switch™ (Sept. 20) featuring cross-platform play between console players. Hover is a fast-paced single and multiplayer parkour game set in a futuristic 3D open world. The game takes place in ECP17, a high-tech city also called Hover City by its inhabitants and located on a distant planet. The Great Admin cut the communication with the Galactic Union and established a strong dictatorship. Having fun has become illegal and entertainment is banished. You’re in charge of a team of young rebels, who fight against the new anti-leisure laws oppressing the city. Equipped with high-tech gears allowing amazing jumps and speed, the rebels can roam the city to sabotage the propaganda, help citizens, and put an end to the oppression by reaching the Galactic Union! An amazing City: Hover City is a huge futuristic colorful city. Its buildings offer breathtaking vertical playgrounds. Astonishing moves: Slide, bounce, dash and wall-jump through Hover City thanks to your high-tech suit. Online multiplayer: Join your friends online at any time and continue the adventure together, whether you are cooperating or working against them. Participate in races, events or score battles created in real time by the community. Level up mechanics: Gain experience and unlock chips that improve the aptitudes of your character. You can trade your spare chips in order to get better ones through the E-Swap trading system. A customizable experience: Instantly switch from single to multiplayer, whenever you want. Play first or third person or activate the auto camera that mixes both and offers you a dynamic experience.